Begin by searing the pork. Season the pork with the salt, pepper, cumin and oregano. In a large frying pan, heat the olive oil over medium heat until shimmering. Add the garlic and red pepper flakes as the oil heats (it will become fragrant and infuse the oil). Place the pork in the middle of the pan and add the half the onions around the the pork. Brown the pork on each side. Once the pork is browned, transfer to a crock pot. Add the orange juice, brown sugar, lime juice, chicken broth and bay leaf and remaining onions. Set the temperature to low. Cover and cook for about 2 hours or until the internal temperature reaches 145 degrees. Turn off the heat and allow to cool in the juices before removing. Slice the bread (or split if using a loaf). 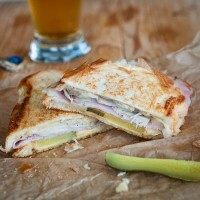 Layer with mustard, cheese, pickle slices, ham, pork and then another slice of cheese. Season with salt and pepper in between the ham and pork layers. Heat a large skillet over medium heat and lightly coat with olive oil. Place the sandwiches on the skillet and top with a heavy skillet (we used a cast iron skillet). Cook for 5 – 7 minutes per side until the sandwich has compressed, the bread is well toasted and the cheese is melted. Note: Total time for this recipe includes 2 hours to roast the pork. Once the pork has been prepared, actual time to assemble and grill the sandwiches is about 15 minutes.